The structure and stellar content of M32 is difficult to explain by traditional galaxy formation models. Recent simulations suggest a new scenario in which the strong tidal field of M31 can transform a spiral galaxy into a compact elliptical. As a small spiral galaxy falls into the central parts of M31, most of the outer layers of the smaller spiral are stripped away. The central bulge of the galaxy is much less affected and retains its morphology. Tidal effects trigger a massive star burst in the core, resulting in the high density of M32 observed today. There is also evidence that M32 has an outer disk. Although usually M32 is thought to be a satellite galaxy as mentioned above, recently a report suggested the possibility that M32 is actually a normal galaxy instead of a dwarf with triple distance compared with the data stated above, and actually located outside the local group with only their position on the sky overlapped. M32 contains a supermassive black hole. Its mass has been estimated to lie between 1.5 and 5 million solar masses. ^ a b c d e f g h i "NASA/IPAC Extragalactic Database". Results for NGC 221. Retrieved 2006-11-29. ^ a b Karachentsev, I. D.; Karachentseva, V. E.; Hutchmeier, W. K.; Makarov, D. I. (2004). "A Catalog of Neighboring Galaxies". ^ a b Karachentsev, I. D.; Kashibadze, O. G. (2006). "Masses of the local group and of the M81 group estimated from distortions in the local velocity field". ^ "SIMBAD-M32". SIMBAD Astronomical Database. Retrieved 2009-11-29. ^ Armando, Gil de Paz; Boissier; Madore; Seibert; Boselli; et al. (2007). "The GALEX Ultraviolet Atlas of Nearby Galaxies". ^ Kepple, George Robert; Sanner, Glen W. (1998). The Night Sky Observer's Guide. Vol. 1. ^ Rudenko, Pavlo; Worthey, Guy; Mateo, Mario (2009). 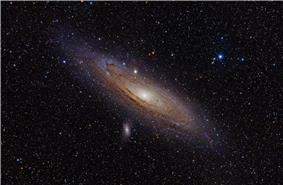 "Intermediate age clusters in the field containing M31 and M32 stars". ^ Graham, A. W. (2002). "Evidence for an Outer Disk in the Prototype Compact Elliptical Galaxy M32". Merrifield, Michael. 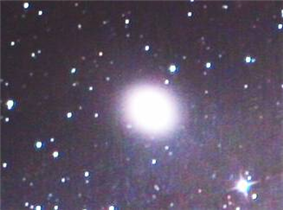 "M32 – Dwarf Elliptical". Deep Sky Videos.